part three in my yoga mini-series. after 8 months of regular use, these are my yoga essentials. sling mat carrier // portable and much easier to use than trying to stuff your mat into a bag after practice. the zip compartment has room for just the important stuff: wallet, keys, phone. small wicking hand/mat towel // i was dubious about whether i needed this, but after a few practices i found it very useful for wicking/combatting sweaty palms and adding some extra stability/grip to the mat. Tamal Dodge intro to yoga DVDs // so good – the pacing and instruction is clear and easy to follow. this is an inexpensive, excellent primer on yoga basics, and a great way to keep up a consistent practice on days when you can't make it to a studio class. each DVD has two programs that are about 45-minutes each, ideal for making time for a daily yoga session. my yoga 'uniform' consists of an Under Armour sports bra, racerback tank (love the longer length – perfect for practice), and black yoga leggings. all of these pieces wear and wash well, and they're versatile enough for general workouts and even non-yoga wear. i hope this is helpful if you're getting started with your practice, or looking to replace/upgrade some of your essentials. do you practice with any of these items? please share your experiences with yoga! // yoga mini-series part 1 and part 2. 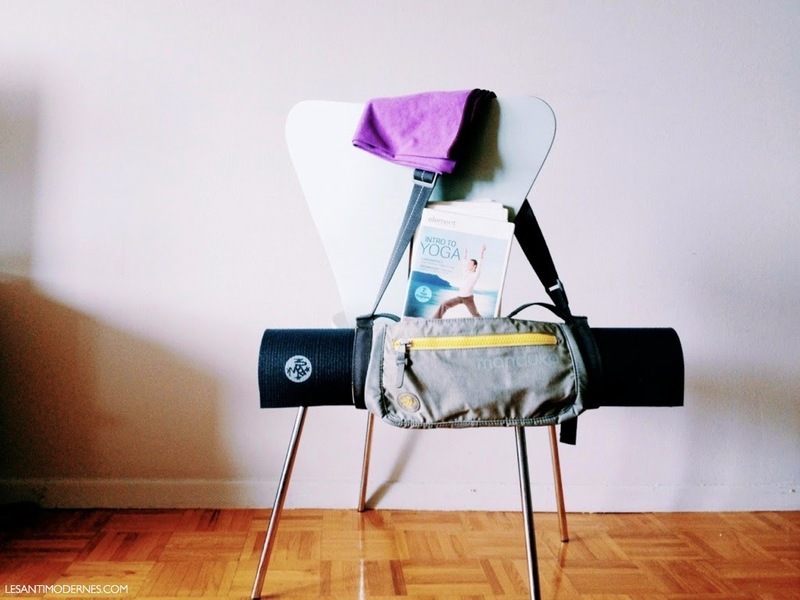 I practiced yoga regularly and have been searching for a thicker and non-slip yoga mat. I came across Tomuno yoga mat from a FAB sale. It's made out of natural rubber, and it's by far my favorite yoga mat. I have used it for almost two years now and it is still in great-working condition. But since it's rubber, the mat is not intended for hot or heated yoga. Maybe I will try the Manduka mat for next. LOVE your blog BTW~and your reviews on Everlane! thanks! that's very sweet of you, let me know if you get the Manduka and how you like it. do comment now and then, if you don't do so already! is it common to bring your own mats for classes? my studio provides the mats, the very one you're using in fact. Most people do bring a thin mat towel though because it is pretty gross to rest your face on a mat used by god knows how many other people. i think a lot of people bring their own mats to studios. i personally am not into the idea of a 'public' mat for hygiene reasons, even with my own towel over it! and for home practice it's just nice to have one go-to that i use all the time.